In 1977-78, Brad Park exploded for 22 goals and 57 assists, earning him a remarkable 79 points. But what is missed in these statistics is Brad's defensive value to the Bruins. Through seventeen NHL seasons, Brad Park exemplified blueline excellence. He was heralded as one of the best defensemen in the league virtually from the moment he first stepped onto the ice with the New York Rangers during the 1968-69 season. But after playing in the immense shadows of some of the greatest players ever to lace up a pair of skates, it looked as though Brad Park was finally going to be recognized as the Norris Trophy winner in 1978. During those seventeen seasons (1969 to 1985) Park toiled in the NHL, only seven players laid claim to the Norris Trophy as the NHL's premier defenseman. In fact, Bobby Orr was the recipient of the Norris in each of the first seven seasons Brad Park played in the NHL. Park was runner-up in four of those seasons. "I saw no reason to be upset because I was rated second to Bobby Orr," smiles Park. "After all, Orr not only was the top defenseman in the game but he was considered the best player ever to put on a pair of skates. There was nothing insulting about being rated number two to such a super superstar." Playing in the shadow of Bobby Orr forced the never-ending comparisons between the NHL's two elite defensemen. "I was too busy playing and trying to help my team to worry about the comparisons," Park admits. "He's Orr and I'm me. We each had individual styles and talents." Brad adds, "I put the Norris Trophy out of my mind when Bobby Orr was around, but I had thought about it from time to time." Park was runner-up to Orr in 1970, 1971, 1972 and 1974, and was second to Denis Potvin in 1976. But with Orr's knees wreaking havoc on his career, it looked like Brad Park would be a shoo-in for the Norris in 1977-78. Park's game had evolved as his career progressed. The freewheeling style that personified his game while with the New York Rangers had become much more defensively sound after being traded to Boston. So much so that Rangers' Hall of Fame goaltender Ed Giacomin joked, "If Brad Park played the type of game he plays today back when we both played for the New York Rangers, I would still be playing and wouldn't have grey hair." Boston coach Don Cherry, who was with the Bruins between 1974-75 and 1978-79, commented, "That line tends to bother Brad but it comes close to assessing how his game has changed over the years." Cherry rated Park the best defenseman in the NHL in 1978. "He doesn't rush the puck as much any more. He's hanging back a bit, playing an exceptional defensive game  the type of game a goaltender loves." Gerry Cheevers, who as Boston's netminder, played behind Park from 1975-76 until 1979-80, later coached Brad and the Bruins from 1980-81 until '82-83. 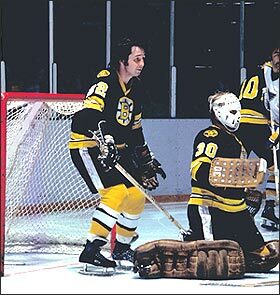 Cheevers remarked, "It's guys like Brad who make coaches like me look like geniuses." 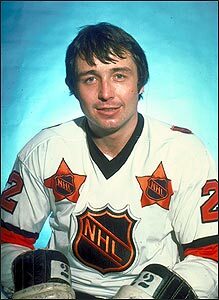 Brad Park earned his fifth selection to the NHL's First All-Star Team with his superb play in 1977-78. It was the last time he would earn such a designation. That same year, Park was runner-up for the Norris Trophy as best defenseman. He'd feel that same frustration six times through his career. In 1978, in spite of playing a more solid defensive game, Park scored 22 goals and added 57 assists for 79 points; his best offensive output since 1974 when he tallied 25 goals and collected 82 points to finish tenth in league scoring. "Don (Cherry) didn't really order me to cut down on the amount of rushing I did, but the things the club was trying to accomplish dictated the changes in my style," Brad explains. "Cherry did tell me that he didn't want me using all my energy going end-to-end on a regular shift plus working the powerplay and killing penalties. He said that I should play a little more conservatively on regular shifts, then do the extra stuff on the specialty teams." Park boiled his new game down to his new strategy: "Instead of trying to do too much over two hundred feet of ice, I was doing more in sixty feet of ice." The Bruins collected 113 points to finish first in the Adams Division in 1977-78, owing much of their success to Park's play which so delighted the journalists that they selected him to the NHL's First All-Star Team. But he wasn't alone in excelling for his team that season, and fans knew that Park's grasp on the Norris was going to be challenged by Borje Salming of the Toronto Maple Leafs and Denis Potvin of the New York Islanders. Although the votes were based on regular season play, the Bruins advanced to the Stanley Cup final, but for a second consecutive spring, lost to the Montreal Canadiens. When the votes were tabulated to decide the winners of the NHL's merit trophies, the Boston Bruins drew a blank right across the board and any hopes of Brad's winning the Norris Trophy for the first time were deflated once again. Park was runner-up in Norris voting for an unprecedented sixth time. He had come second to Bobby Orr four times and then in 1976, Brad was runner-up to Denis Potvin. In 1978, the Norris curse continued for Brad Park  he was runner-up once again, and again to Denis Potvin. For a player of Brad Park's stature, the 1977-78 season could be regarded as a sizeable disappointment  yet another year without his name engraved on the Stanley Cup and a sixth time having another star defenseman chosen ahead of him for the Norris Trophy, yet the affable Park selected this particular season as the pinnacle of his NHL career. Unfazed, Brad Park can only smile. "I had a good year but the team had a heck of a year." A team guy to the end.